The global function as a service (FaaS) market has been gaining pace in recent years as the associated services help end users carry out programming, manage, and run application along with other functions. All these processes are possible without the need to manage any of the services from a manual perspective. Thus, the presence of a platform that reduces the necessity of building and maintaining infrastructure in developing and running new applications has stoked the demand for quality FaaS. A notable benefit of this service involves a fantastic reduction in the cost of operations needed to for various organizations. As per expert analysts, the global function as a service market had registered an initial valuation of US$1230.0 mn clocked in 2016. This revenue is further expected to reach the figure of US$4280.0 mn by the end of 2025. Such growth is prophesized to occur at a fantastic CAGR of 15.3% during the forecast period from 2017 to 2025. The global function as a service market is mainly divided into various segments on the basis of type, service, end use, and by region. From the perspective of type, the market is divided into two segments: developer centric FaaS and operator centric FaaS. By service, the global function as a service market consists of key segments such as - service Monitoring and management, automation integration services, maintenance services, consulting services, and others. Lastly, by end user industry, the function as a service sector comprises work domains in the form of defense and surveillance, telecommunication, banking and finance, healthcare, media and entertainment, hi-tech industry, manufacturing, and others. In terms of end user industry, the healthcare sector has held a leading position in the market from the perspective of revenue gained. This is mainly due to a rising demand for improved healthcare facilities occurring in most walks of life all over the globe. Moreover, function as a service processes provide benefits such as improved data usage, less costs, and enhanced medical research. These factors make several organization deploy the processes in their day-to-day activities, thus making the segment gain splendid revenue. Geography-wise, the global function as a service market is spread across North America, South America, Europe, Asia Pacific, and the Middle East and Africa. Of these, North America gained most prominent in this sector from the perspective of revenue shares. 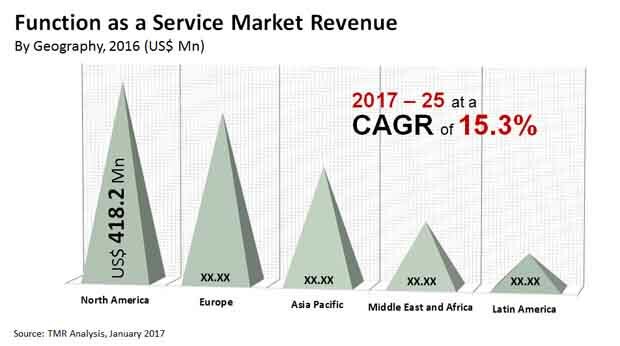 Apart from North America, Europe bags the second spot in the function as a service market in terms of revenue growth. However, experts suggest that Asia Pacific is also anticipated to expand at a fast rate in future due to increasing employment of modern technological processes. Moreover, a mushrooming IT sector in Asia Pacific it is envisaged to stoke growth in the global function as a service market. Oracle Corporation, Microsoft Corporation, Google Inc., New York, Amazon Web Services Inc., SAP SE, Dynatrace LLC, International Business Machines Corporation, Rogue Wave Software Inc., Infosys Limited, and VMware Inc., are key players operating in the global function as a service market. Function as a service (FaaS) could also be defined as a section of cloud computing service which provides a platform for customers to develop, manage and run applications functionalities without the complication of maintaining and building infrastructure which are typically involved in developing and launching new apps. Function as a service (FaaS) is a cloud service which enables service less management and app development. Function as a service enables the end users to conduct programming and other task without having to manage their servers. String of code are generated with events on the end users and outsourced to servers which are located away from the user who can execute the planned function. The application of function as a service to develop a new app enables the end user to have a server less architecture. The function as a service is mostly used while building micro services applications. Some of the key function as a service product from key players includes, Google cloud function, AWS Lambda and Microsoft Azure. The application of cloud computing provides organizations to shift their focus from IT infrastructure and give more attention to their core services and products. These days most businesses use cloud services. The application of cloud service provides exemptions from worrying about underlying infrastructure issues. The application of server less architecture provides improved efficiency, speeding time to market and helps in reduction of cost. The server less cloud is an evolutionary process in leveraging cloud computing to its full potential. The function as a service market by type has been segmented into developer centric faas and operator centric faas. The function as a service by service has been segmented into service monitoring and management, automation integration services, maintenance services, consulting services and others. The function as a service by end use industry has been segmented into defense and surveillance, telecommunication, banking and finance, healthcare, media and entertainment, hi tech industry, manufacturing and others. The global function as a service by geography has been segmented into North America, Latin America, Middle East and Africa, Asia Pacific and Europe. The market report deals in the forecast of the Function as a Service market in terms of revenue (USD million) as well as the CAGR for the forecast period 2016 to 2027. The competitive profiling of the key players in the global Function as a Service market has been comprehensively covered under the scope of the report. The key players in the Function as a Service Market have been competitively profiled across the five broad geographic regions. This competitive landscape is inclusive of the various business strategies adopted by these major players and their recent developments in the field of function as a service market. In order to provide a detailed insight into the market dynamics of global Function as a Service Market, the drivers and restraints affecting the industry are included in the study. Market dynamics include market opportunity, drivers and restraints and an extensive analysis of these factors are included in the report. Furthermore, market attractiveness breakdown has also been provided in the report. Therefore, the report provides a comprehensive study of the global Function as a Service market and also offers the forecast of the market for the period from 2017-2025. Some of the key players operating in the function as a service market include Google Inc. (California, U.S.), International Business Machines Corporation (IBM) (New York, U.S.), Amazon Web Services Inc. (Washington, U.S), Microsoft Corporation (Washington, U.S.), Infosys Limited (Bangalore, Karnataka,India), SAP SE (Walldorf, Germany), Dynatrace LLC (Massachusetts, U.S.), Rogue Wave Software Inc. (Colorado, U.S.), VMware Inc. (U.S.) and Oracle Corporation (California, U.S.).